When the top four ranked men in the world tangle in the Australian Open semifinals, the one thing that won't be missing is familiarity. 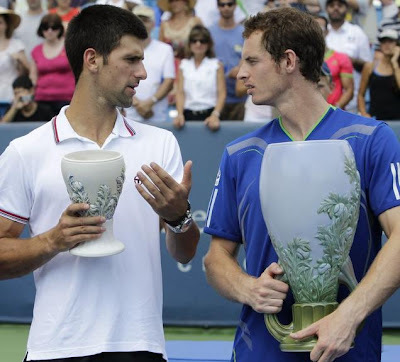 Novak Djokovic has faced Andy Murray ten times in tour-level matches. 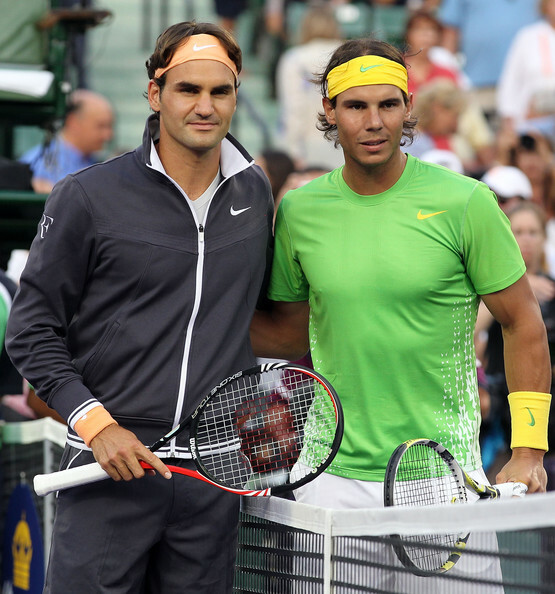 Roger Federer and Rafael Nadal have seen each other across the net 26 times in tour-level matches. To say the players know what to expect from one another is a gross understatement. At the same time, to say the results are written in stone is just as inaccurate. What we can say without qualification though is that the four best men in our sport will take the court with a (roughly) 50/50 chance of reaching the Australian Open final. Novak Djokovic won almost everything last year, true story. I'm sure Andy Murray wishes he knew that was the script when the lost that final to Djokovic in Melbourne a year ago. Djokovic was the No. 3 player in the world at the world, so it wasn't a bad form loss for the then and current No. 4 Andy Murray. It was more HOW Murray lost. Gluten-free Robo-Nole made Murray look frankly irrelevant on that night last January. The psychological toll of the loss rendered the Scot exactly that for most of the next six months, irrelevant. After the Djokovic loss, Murray didn't win a single match between the Australian Open and Monte Carlo. He, frankly, could only be arsed to suit up three times in that period. Djokovic on the other hand, didn't lose until deep into Paris. 43 matches...win, after win, after win. Over the last few years Andy Murray has been Mr. Almost; to wit, in the 2011 majors, Murray notched three semis and a final. The result, three losses to Nadal and one to Robo-Nole. We all know what Djokovic did: 70-6, three majors. So how will this next chapter play out? Murray's toughest match thus far was his first rounder against American comer Ryan Harrison; he was in fact, the only player to take a set off Murray this Australian Open. Unfortunately for him, that's less indicative of how well he's playing than the fact he hasn't seen a player seeded higher than No. 24 Kei Nishikori all fortnight. Yes, Nishikori's a professional and an excellent prospect at that, but the step up between Nishikori and Djokovic is massive. Djokovic, for his part, also only lost just one set in his march to the semifinals, dropping a frame to once presumed-dead Lleyton Hewitt in a crackling fourth rounder on the Aussie's home court at Rod Laver Arena. We expected him to be tested in the quarterfinals versus fifth ranked David Ferrer, but the indefatgable Spaniard offered precious little resistance. A first set tiebreak and a single break second was all Ferrer could muster before Djokovic bid him adios in a 6-1 third set. In other words, while Murray was never tested; Djokovic saw off the No.5 player in the world like an ambitious qualifier. Outlook: Talk about Ivan Lendl all you want. The moment and the match belong to those between the lines. Nadal: Shoulder injury, but seems to be alright. Does that pretty much recap the coverage of these two still-active legends over the last fortnight? Sorry, but paying the storylines more than a cursory glance seems too much a rehash for two of the most discussed players in the history of the planet. Nadal's Australian Open was very Nadal-like. The Man from Mallorca never seems to win easy, even when at his best, his sub two hour submission of Lucas Lacko being the exception that proves the rule. Nadal matches always seem on the razor's edge. There are nervy moments, like at the end of each of the first two sets of his quarterfinal versus Tomas Berdych; there are also moments of the sublime like when Nadal won 85% of his firset serve points against Lacko. The Spaniard could already be on his way back to Mallorca for a month of rest and relaxation, but he's here, contending for his 15th berth in a major final against the most familiar of foes. Like Murray, Federer only saw one seed en route to his semifinal, No. 11 Argentine, Juan Martin Del Potro. It was a statement match, but I'm not sure for whom. Yes, Federer won big over the Argentine, but Delpo also didn't play at anything approaching the level he did in the fabled 2009 US Open final. While Federer seemed to play better than he did in the '09 US Open final and he did it for long enough to square away the win. Outlook: The conditions and history favor Nadal, hands down. That said, Federer has seemed to play above his level all tourney; while Nadal played below his. An additional main distinction between your 2 versions may be the existence of the one-way gasoline get away louis vuitton replica sale control device reverse the actual turning overhead within the Sea-Dweller. This particular unique function may be put into this to safeguard the actual view through inner stress, that builds-up once the scuba divers navigate to the decompression chambers. Heavy ocean scuba divers make use of a helium/oxygen blend within their atmosphere tanks, which could very easily penetrate the actual very from the view. Nevertheless, throughout decompression, helium contaminants aren't able rolex replica sale in order to emerge from the actual view, therefore, coming the actual very from the view. The actual gasoline get away control device had been the actual an answer for this issue, that has demonstrated quite effective. The present Sea-Dweller versions have a bigger as well as enhanced gasoline get away control device. Additionally, you will breitling replica sale discover that the actual Sea-Dweller is actually larger than the actual Submariner. This particular mainly is due to the actual heavier sapphire very which makes the actual previous regarding 4mm heavier compared to second option. The actual heavier very additionally results in an additional significant distinction between your 2. Even though Sea-Dweller shows the actual day, it doesn't function the actual Cyclops zoom lens tag heuer replica sale (magnifying zoom lens). The actual heavier very doesn't permit this type of magnifying zoom lens. As to the Degree the actual Sea-Dweller is comparable to the actual Submariner?